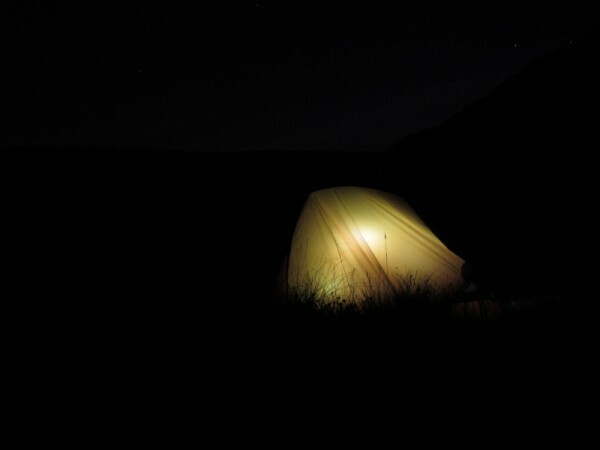 The weather was looking good, it was a bank holiday weekend, that could only mean one thing: it was time to go camping. 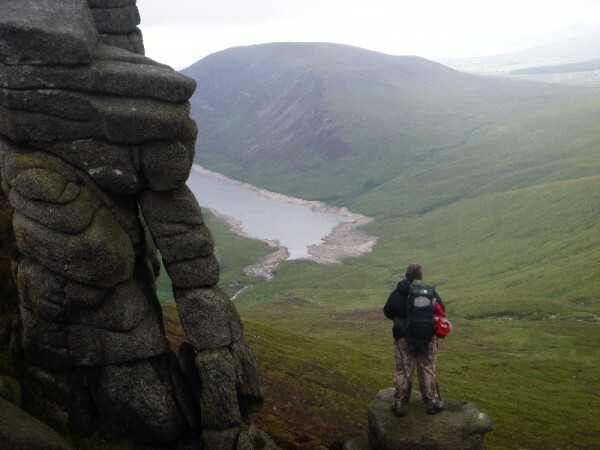 We packed our kit and enough food to do us for a night and a day, and traveled to Newcastle Co. Down, our usual starting point to the Mourne Mountains. 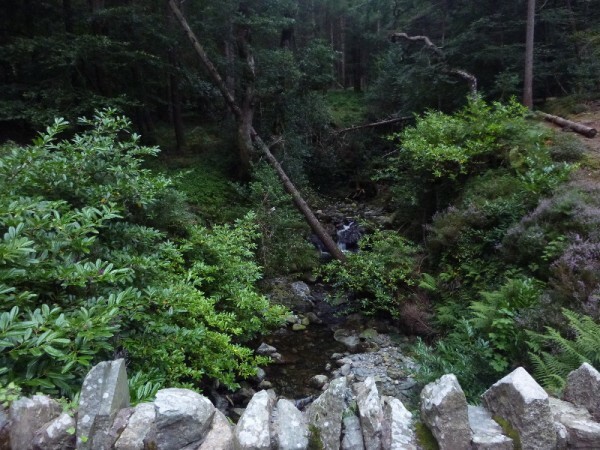 We met at Donard Park, and from here made our way towards Tollymore Forest where we would walk along towards the Trassey Track, and find a spot to sleep for the night. 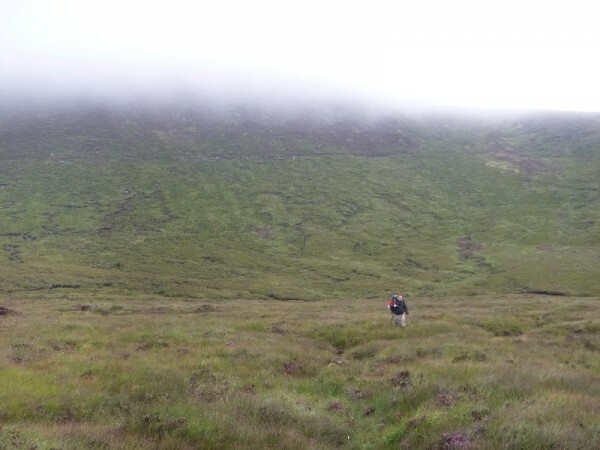 The next day we would contour around Slieve Bearnagh and onto Ben Crom, for some food and exploration. 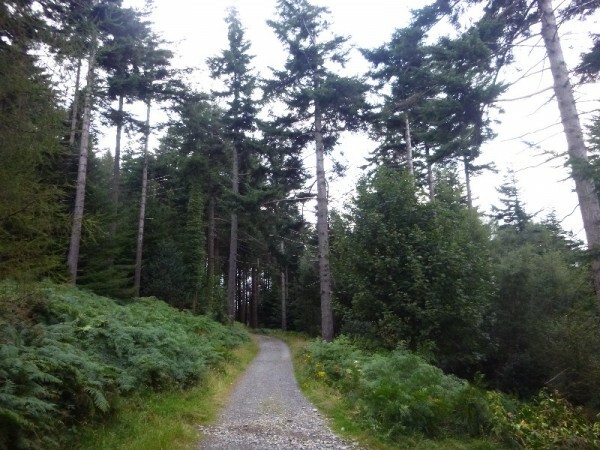 As we walked through Tollymore forest we enjoyed a chat and picked some wild blackberries to eat on the trail. Keeping to a nice natural pace we made our way along the forest tracks towards the Trassey Track. As the sun continued to get lower in the sky, we passed beautiful bridges and waterfalls and never met another walker. By the time we made it out of Tollymore and onto the Trassey Track, the head torches had to come out. The earlier setting of the sun was a reminder to us that summer is gone and the winter is approaching. 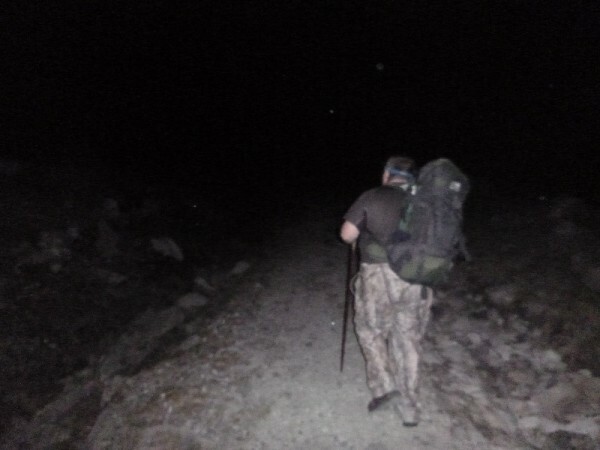 We walked in the dark for a while along side sleeping sheep while letting our eyes adjust to the darkness, it was impressive just how much your eyes adjust to the lack of light. We found a dry spot to sleep for the night and wasted no time in getting the tents up and some supper on. Just as we arrived at our camp spot, the clouds cleared and the sky opened up to reveal one of the best starry nights I’ve seen. It was turning into a real nice night to camp on. Throughout the night we were woken by heavy rain hitting our tents, thankfully by the morning the rain had stopped and it had dried up. Not so thankfully, having camped next to a river, we were feasted up by a swarm of midges, some of the most ferocious we have ever seen. We wasted no time in packing up and we were on the trail for 7am. 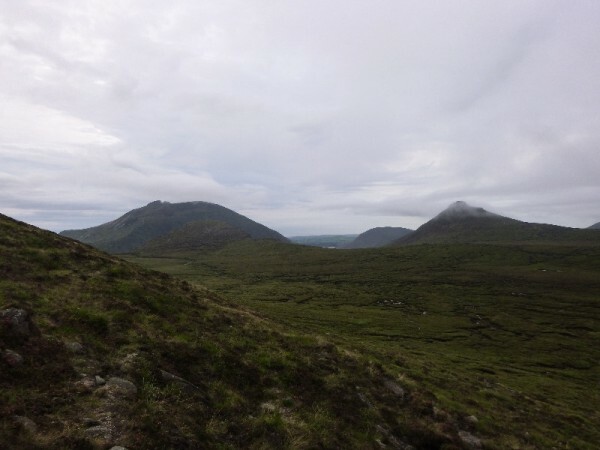 Our route to Ben Crom involved traveling over the Bearnagh & Meelmore col and cross the bog. 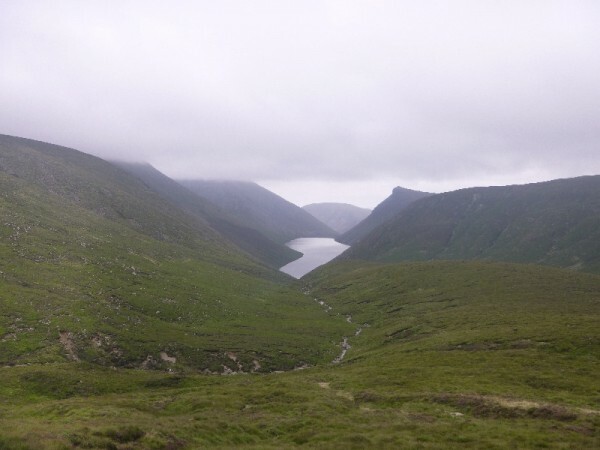 After this we would walk back around the other side of Slieve Bearnagh and use the Brandy Pad to get back to the saddle, then down the Glen River path and home. 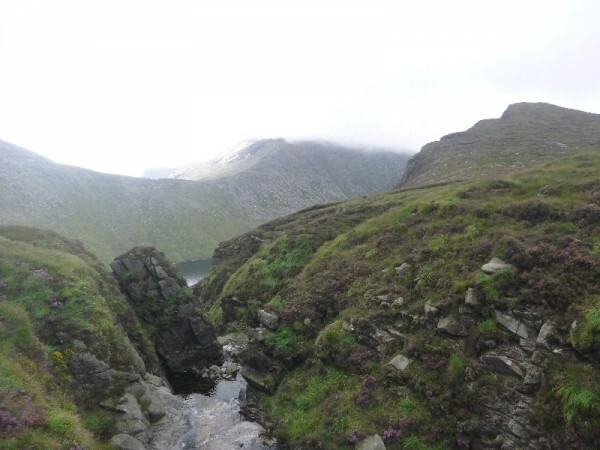 We soon reached the col and crossed over the stile to get on the other side of the Mourne wall, now all we had to do was cross a boggy section of land and make it to Ben Crom, and back to Newcastle! 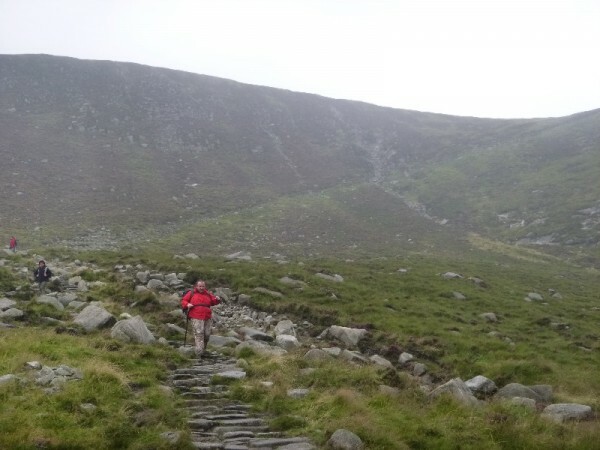 There wasn’t much of a track to walk along when trying to get around Slieve Bearnagh, so we just had to make do and guess which sections of grass were dry and which were deep puddles. 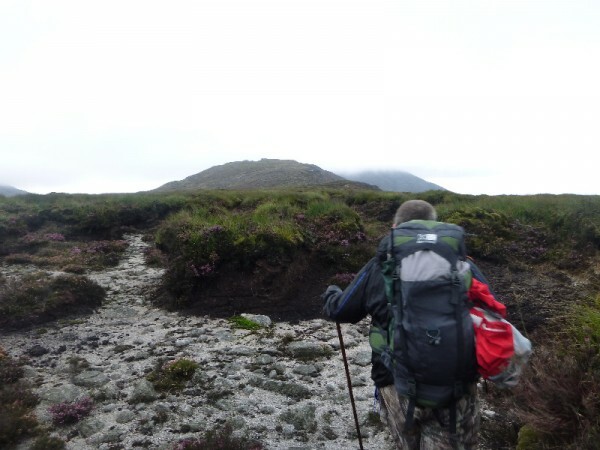 After what seemed like hours walking through the bog, we found what looked like a dry river bed that has been used as a path leading to Ben Crom. This was much easier to walk on and gave the legs and feet a rest from jumping over boggy ditches. 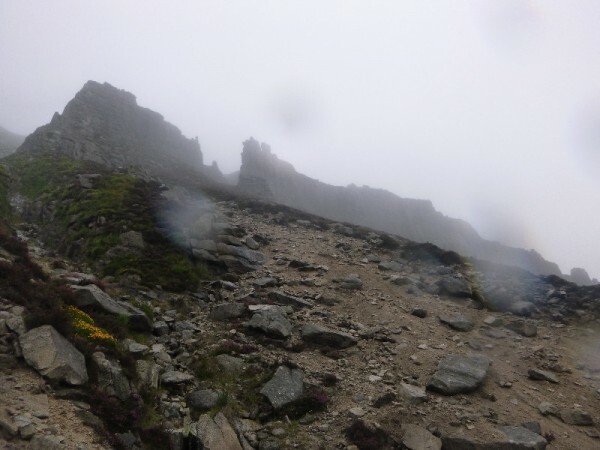 We finally made it to Ben Crom and decided that before we would have a look about the summit, we would explore the Ben Crom caves and eat some well deserved breakfast. Our legs were tired from the bog tramping and a rest was well timed. 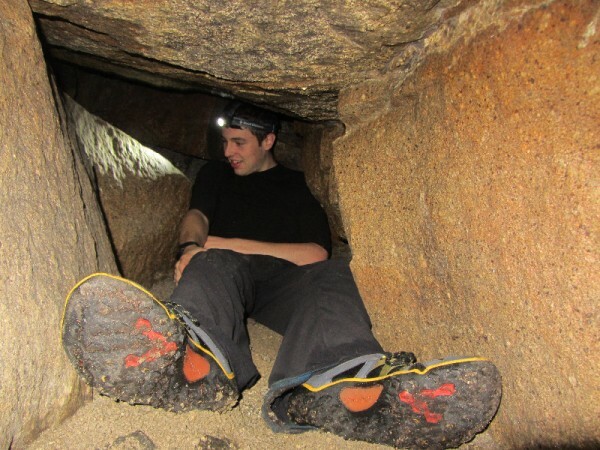 Exploring the Ben Crom caves was fun, although it was a bit of a squeeze. We found the hidden geocache there and signed our names on the record book. These caves could serve as a emergency shelter to those who are in trouble, as they provide great protection from the wind and the rain. There is enough room for at least two people to sleep in them, as long as you are no stranger to a rough night. After we had a look around the caves we decided food was needed, sadly our breakfast was spoiled by our hated followers – the midge. We were swarmed upon while eating and had to relocate quickly to somewhere with more of a gust of wind. The breakfast location change wasn’t a bad move as we found ourselves with even more of a view than we had before. After we had our breakfast we made the short walk from the Ben Crom caves to the summit of Ben Crom itself. 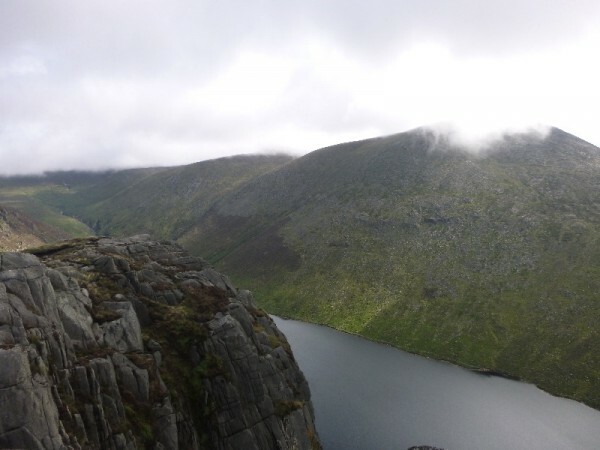 This was my first time on Ben Crom and I was blown away by the views of the reservoir beneath it. 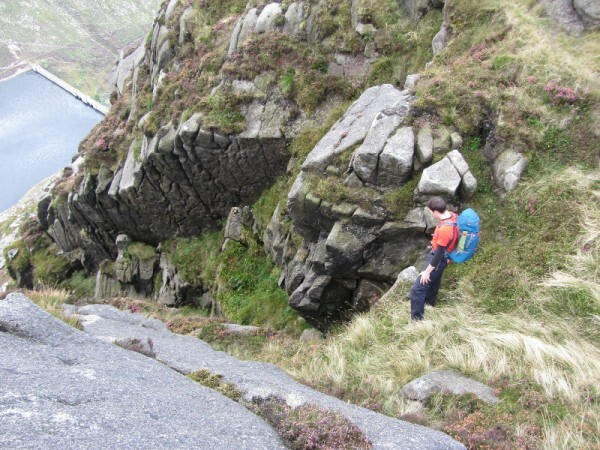 The sheer scale of the drop down to the water was quite scary. It was simply amazing to sit on top and have nothing but air to one side of you. For twenty minutes we sat and enjoyed the views before a wave of mist moved in and we decided to get off the top and start to make our way back. 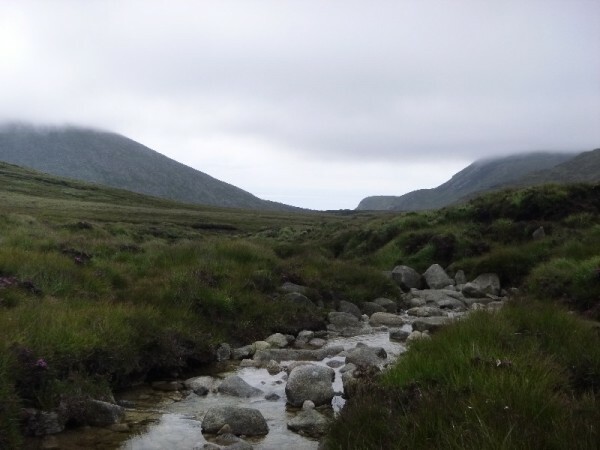 On our way back we crossed a few rivers and streams and finally made it onto the Brandy Pad, which would lead us to the Slieve Commedagh and Slieve Donard col, where we would cross the stile and head down the valley home. As we were traveling along on the Brandy Pad we were able to look back and see the view of where we had just come from. The view of Ben Crom and Ben Crom reservoir was made even more outstanding, knowing that only a few hours ago we had seen it from a completely different perspective. Keeping with tradition the weather soon took a turn for the worse and it started raining. We stopped to pull our coats on and soon found that the mountains on either side of us were impossible to see due to the low cloud and rain. We walked past the impressive “Castles of Commedagh”, which are massive granite rock formations that look very similar to the towers you would see on a castle or garrison. 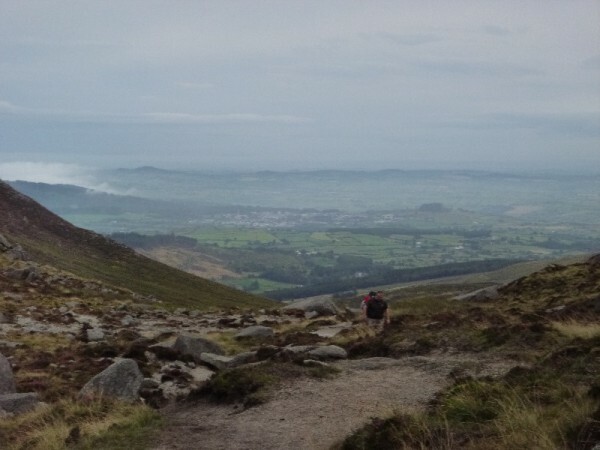 So with sore feet and soaked clothes we made our final leg down the Glen River valley and back to Donard Park. 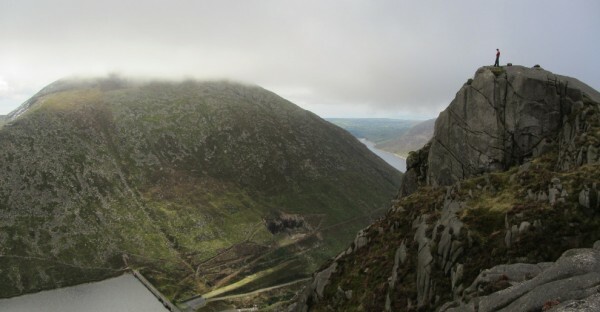 A lovely walk made even better by the overnight camp and the views we witnessed.